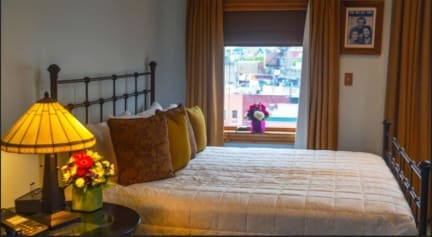 Good place to stay in a trendy area and it’s well connected to different touristic spots in NY. The only thing that makes it impossible to describe this place as a perfect one is that there’s no breakfast included. Almost everything was great. The only problem were some of the receptionists. Extremely impolite. One asian lady with Russian accent became mad angry with an elderly Danish woman because she didn't understand her explanation on how to make the Uber app work in her phone. And an African-american lady was also very difficult. I seriously recommend a psychologist or counselor for the former. The environment is great and the room is comfortable. Noisiest bed ever - creaked when I would move an inch and I could tell I was waking not only myself, but others up. Good sized room, but they need to put bigger lockers in - can’t even fit a small backpack in the current ones. The drain in the bath/shower clogged so water would fill up at your feet which was gross. The room and bathroom was clean but. Great location to subway, good bars and entertainment etc. Was happy they let me keep luggage downstairs free of charge after checkout. This could be a great hostel if it was only for international travelers or students, when you accept locals you ran some risks of having skechy people like the ones in my room. Please provide thicker blankets for colder seasons! My bed was next to a closed window that was improperly sealed, so I spent the night shivering under a thin blanket. Rooms were clean showers were clean new bed sheets and towels every day Not a hostel to go to if you want to meet new people, no common room no kitchen. No lockers to keep valuables. Staff seemed friendly though. 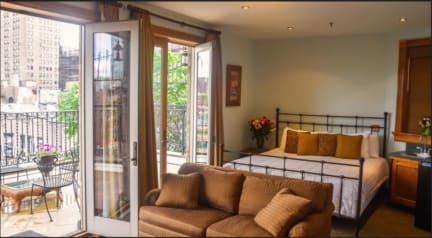 Location very good not far from anything in the city less than a minute walk from the closest metro station. Overall its a nice hotel for someone whos looking for a cheap accomodation in NYC. The check in process was slow and took a long time which was upsetting for people who are coming from long flights. The shared rooms are ok. The location is not wow, but again.. you get what you pay for.